This 3 speed, low amperage dryer is powerful and versatile in addition to it legendary sustainability. 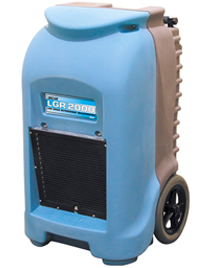 The LGR 2000 refrigerant dehumidifier offers exceptional performance across the full range of job-site conditions – low humidity environments and high temperatures (up to 125ºF). 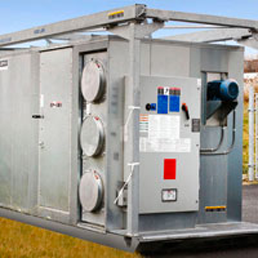 The unit is engineered for heavy demands of water damage restoration and rental use. 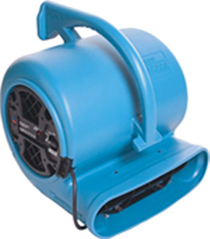 A rugged roto-molded housing and durable construction make this dehumidifier a top choice for professionals everywhere. 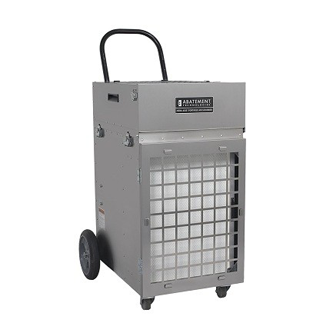 This 5000 CFM Desiccant Dehumidifier has high static pressure to quickly dry out any building structure affected by water or humidity. A single unit can easily replace 15 LGR 2000 dehumidifiers. Very versatile connection: 600V, or a combination of 600V / propane or 600V / natural gas. The device can be installed outside a damaged building; only the 18’’ hose goes inside to let in 5000 CFM of air at 5% humidity ! This dehumidifier will accomplish three complete air exchanges in of a 10 000 square foot room (10 foot ceiling) per hour. Sets up easily and works fast. Perfect for dry out water-damaged hardwood. 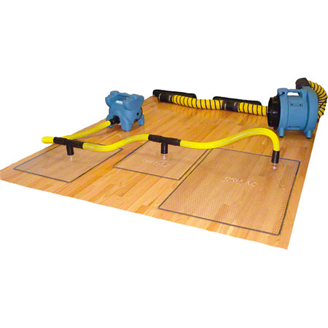 The Rescue Mat System uses a high-pressure blower to push water vapour right through the surface of the floor. Two different sizes make it easy to custom fit to any floor layout. 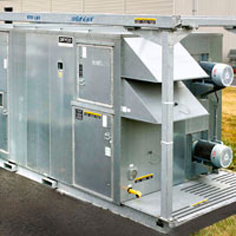 This 15,000 CFM Desiccant Dehumidifier has high static pressure to quickly dry out any building structure affected by water or humidity over several floors. A single unit can easily replace 45 LGR 2000 dehumidifiers. Very versatile connection: 600V, or a combination of 600V / propane or 600V / natural gas. The device can be installed outside the damaged building; only the three 18’’ hoses go inside to let in 15,000 CFM of air at 5% humidity! Essential to dry out major water damage over several floors. An efficient and cost-effective solution. This dehumidifier will accomplish three complete air exchanges in a 30 000 square foot room (10 foot ceiling) per hour. PAS 2400 is equipped with a 4-stage filtration system and a detachable pre-filter. It allows air filtration performance up to 2,100 CFM. Perfect for potential fungal contamination (presence of mould or sewer back-up). Equipped with a 99.97% individually tested & certified HEPA filter. Ensures your customers no contaminants in the air and captures all the dust produced during construction restoration projects (demolition, dry out, reconstruction).